@CrevsDaak I only just began a new game, I haven't made it to Spellhold yet. I redownloaded from the provided link and his katana is still unusable. Added through EEKeeper, and the sword turns to 7 gold. 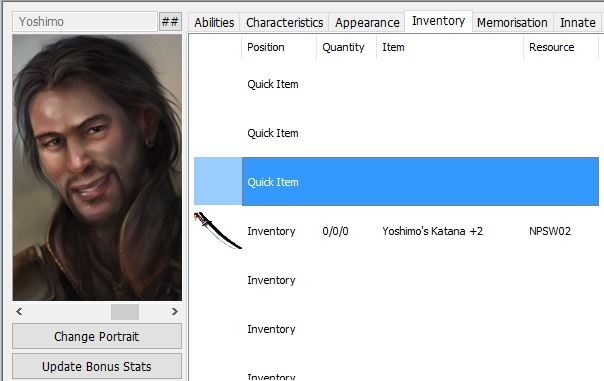 @CrevsDaak I was able to fix the issue by renaming the items so they don't start with numbers, and then changing the Torosan creature file to reference the newly renamed katana. For Yoshimo, I just EEKeepered his newly renamed katana. So far, so good, and the dialog triggers appear to be working as well. I am using several mods (including UB, IR, RR, Item Upgrade) so it could be an issue caused by another mod(maybe Item Revisions?). @stewelement k, nice that you got it there. I'll see wth is going on with the katana and fix it when I get home (which is in like 10 days sorry lul). How do I install this? There's no .exe in the zip file. @Raduziel While it is an error you can work around it by creating your own. Just copy any other .exe installer and rename it to Setup-7C-Yoshi.exe and I think it'll work. Will do my best. Love that asian fellow. Didn't worked. The installed showed "Undefined String". @Raduziel post your 7c-yoshi-setup.debug file please. Also, check setup.tra is present in 7c-yoshi/lang/english/. @CrevsDaak can you explain like I was a toddler? Install Component [UNDEFINED STRING: @9900]? Install Component [UNDEFINED STRING: @9910]? @Raduziel seems like the .tra files that contain the mods' strings are missing. Check that all these files are present in the 7C-Yoshi/lang/english/ folder. If some/all of them are missing, try re-downloading the mod and replacing them. If they're STILL missing, I'll give you the file contents or upload them elsewhere. If only setup.tra is missing, I can already deduce why it is missing, anyway. Did a retry and worked like a charm. Probably I was doing something stupid with a half-awaken brain. Yoshimo can't use his katana anymore. Is it expected? Gah! I swear I fixed that over ten times! He SHOULD be able to use it. Gonna look into it after I have dinner. @CrevsDaak Do I need to start a new game? No, because it's just the item file what got changed. You can continue your game. 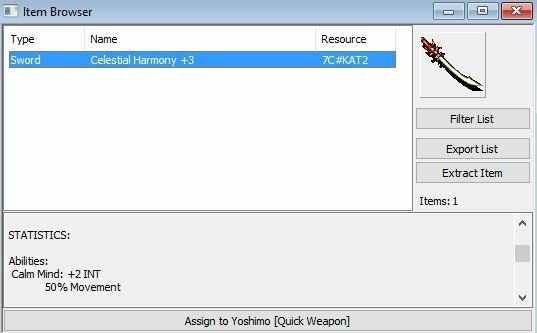 @CrevsDaak So... everytime I try to create Yoshimo's Katana +1 in EEKeeper (Resource 7C#KAT01) Yoshimo ends up with 7 gp in his quick weapon slot. I got Item Revision. Could be some conflict? The first mod was installed before IR, this hotfix comes after. 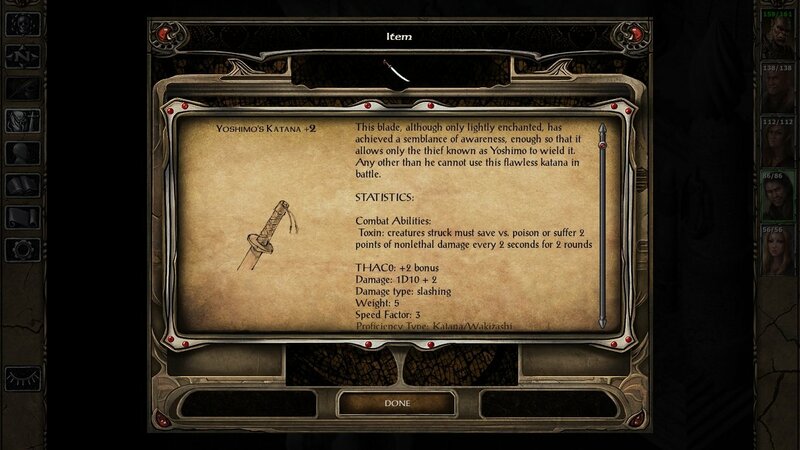 @Raduziel why would you need to create Yoshimo's katana? 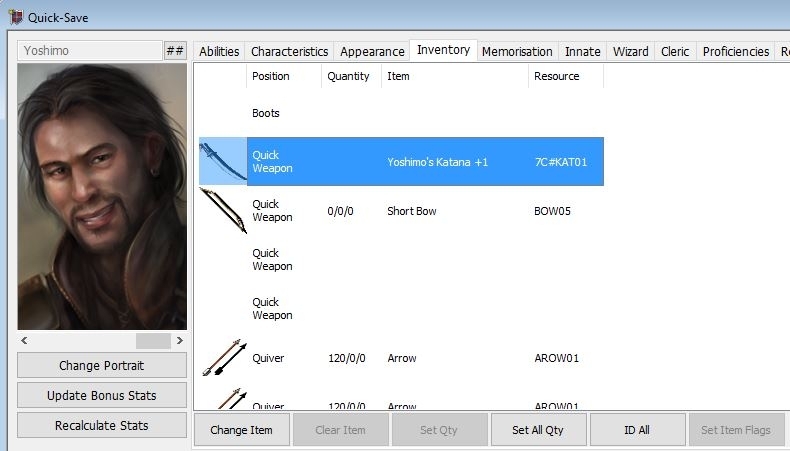 And even if you did, that's not the katana you're looking for, this one is a copy this mods uses elsewhere. The one you need is npsw02. 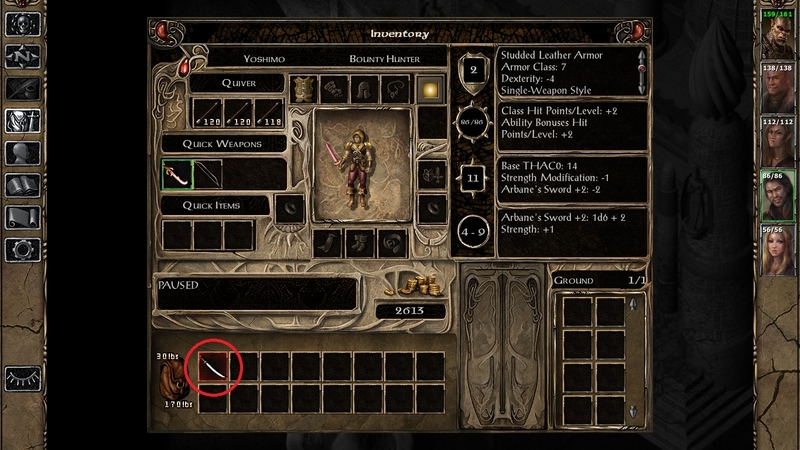 The bug is caused by the game's engine, it happens whenever an item which filename's starts with a number is created. I've solved this by getting another modding signature (c7 instead of 7c, very creative indeed) but haven't updated all my mods to use it yet. @CrevsDaak Because I'm kind of dropped his original katana somewhere close to Irenicu's bathtub. The sword npsw02 (nice upgrade, by the way) still unusable by him. @Raduziel Is your Yoshimo Chaotic Good? It doesn't look like KY touches Yoshimo's Katana but it can change his alignment. I know Item Revisions makes it a +2 weapon though, and it will assume Yoshimo's True Neutral. @Artemius_I He was Chaotic Good indeed. Changed back to True Neutral and the sword became usable. Thank you all for solving this one for me. KY patches the sword if the "Make Yoshi CG" component is installed, but IR overwrote it since it doesn't patch stuff (because the mod's too complex). Just install KY after IR next time (right now if it works; you're good, but have in mind that the other swords won't be usable by Yoshimo). Thanks for putting together what seems like a great mod! Unfortunately, I'm having trouble installing it. 3. Ran setup-7C-Yoshi.exe using Wine. A SETUP-7C-DEBUG file appeared, but otherwise nothing happened. I've attached the debug file to this post in a zip archive. Now, my hunch is that my issue lies with step 2. However, I have no idea how to run the .tp2 files that come with BG2 mods using a Mac version of weidu - maybe that's what I need to learn? Maybe running the Windows version using Wine isn't working? Is it possible I have a problem with Wine? I can't get EE Keeper to work either (crashes when loading save files) and I'm running that on Wine. Separate issue, of course, but wondering if that's indicative that Wine isn't running properly on my machine or I'm simply not using it right. UPDATE: I reinstalled Wine completely using Homebrew (I also have the Winebottler app just dragged to my applications folder, which is apparently an entirely separate thing) and now running setup-7C-Yoshi.exe does absolutely nothing, not even creating a debug file. (Incidentally, EE Keeper now works just fine.) What am I doing wrong here? @demon9675 you should be using the Mac version of WeiDU, not the Windows one through wine. Get the latest version here: http://forums.pocketplane.net/index.php/topic,29577.0.html You seem to know some stuff so throwing you the advanced solution. You should drop weidu and weinstall onto your $PATH (if you don't know what $PATH is, drop them in /usr/bin/), go to Terminal, cd to the game's directory and just call "weinstall 7c-yoshi", should do it. What's nice about this is that you don't have to rename stuff around anymore, just call weinstall and it'll open WeiDU for that mod without you having to do anything else. 3. Used Terminal to cd to game directory and input "weinstall 7c-yoshi"
Terminal simply told me "Permission denied." So I tried using "sudo weinstall 7c-yoshi" and got the message "weinstall: command not found." I've confirmed /usr/bin is indeed part of my $PATH, and even tried moving weinstall and weidu to /usr/local/bin and other parts of my $PATH to no avail. Since that's the advanced solution, what's the simple one? UPDATE: Tried using the WeiDU Launcher for OSX posted here. The terminal opened properly, but returned another "Permission denied" message. I've made sure all the files in the game data folder as well as the 7C-Yoshi folder have read & write permissions, but no dice. I don't see this permissions problem with BG2 Tweakpack, another WeiDU-based mod, so it seems to be unique to the Yoshimo mod. Ideas? UPDATE2: Solved it! Used Terminal command to allow the setup-7c-yoshi file that was created by the WeiDU Launcher to be executable as explained on the second post on this page. I could probably use a similar command to get your $PATH method working, too, but with the WeiDU Launcher I'm not sure I want to bother at this point. Basically, none of my problems were actually unique to your mod and all had to do with the complexities of modding in OSX - there need to be more clear guides on that topic, since I had to root through forums to figure out how to do it properly. I appreciate your help nonetheless! Is this compatible with EET? @CrevsDaak how do I install with bigworld project? @sansserif I have no clue about anything related to BWS/BWP, sorry. Personally, I'd recommend using a small-to-medium sized install with no other mods that add content for Yoshimo tbh, since this mod is largely untested.